Secondary flight control systems may consist of wing flaps, leading edge devices, spoilers, and trim systems. Figure 6-17. 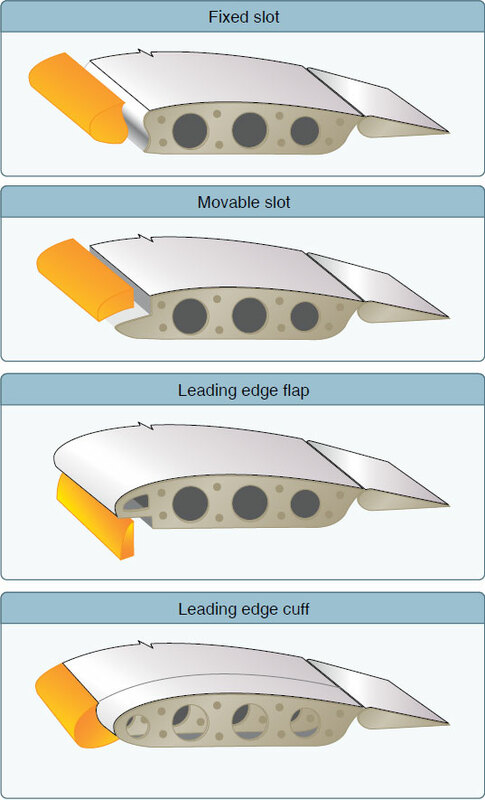 Five common types of flaps. The plain flap is the simplest of the four types. It increases the airfoil camber, resulting in a significant increase in the coefficient of lift (CL) at a given AOA. At the same time, it greatly increases drag and moves the center of pressure (CP) aft on the airfoil, resulting in a nose-down pitching moment. The split flap is deflected from the lower surface of the airfoil and produces a slightly greater increase in lift than the plain flap. More drag is created because of the turbulent air pattern produced behind the airfoil. When fully extended, both plain and split flaps produce high drag with little additional lift. The most popular flap on aircraft today is the slotted flap. Variations of this design are used for small aircraft, as well as for large ones. Slotted flaps increase the lift coefficient significantly more than plain or split flaps. On small aircraft, the hinge is located below the lower surface of the flap, and when the flap is lowered, a duct forms between the flap well in the wing and the leading edge of the flap. When the slotted flap is lowered, high energy air from the lower surface is ducted to the flap’s upper surface. The high energy air from the slot accelerates the upper surface boundary layer and delays airflow separation, providing a higher CL. Thus, the slotted flap produces much greater increases in maximum coefficient of lift (CL-MAX) than the plain or split flap. While there are many types of slotted flaps, large aircraft often have double- and even triple-slotted flaps. These allow the maximum increase in drag without the airflow over the flaps separating and destroying the lift they produce. Fowler flaps are a type of slotted flap. This flap design not only changes the camber of the wing, it also increases the wing area. Instead of rotating down on a hinge, it slides backwards on tracks. In the first portion of its extension, it increases the drag very little, but increases the lift a great deal as it increases both the area and camber. Pilots should be aware that flap extension may cause a nose-up or down pitching moment, depending on the type of aircraft, which the pilot will need to compensate for, usually with a trim adjustment. As the extension continues, the flap deflects downward. During the last portion of its travel, the flap increases the drag with little additional increase in lift. Figure 6-18. Leading edge high lift devices. Fixed slots direct airflow to the upper wing surface and delay airflow separation at higher angles of attack. The slot does not increase the wing camber, but allows a higher maximum CL because the stall is delayed until the wing reaches a greater AOA. Movable slats consist of leading edge segments that move on tracks. At low angles of attack, each slat is held flush against the wing’s leading edge by the high pressure that forms at the wing’s leading edge. As the AOA increases, the high-pressure area moves aft below the lower surface of the wing, allowing the slats to move forward. Some slats, however, are pilot operated and can be deployed at any AOA. Opening a slat allows the air below the wing to flow over the wing’s upper surface, delaying airflow separation. Leading edge flaps, like trailing edge flaps, are used to increase both CL-MAX and the camber of the wings. This type of leading edge device is frequently used in conjunction with trailing edge flaps and can reduce the nose-down pitching movement produced by the latter. As is true with trailing edge flaps, a small increment of leading edge flaps increases lift to a much greater extent than drag. As flaps are extended, drag increases at a greater rate than lift. Leading edge cuffs, like leading edge flaps and trailing edge flaps are used to increase both CL-MAX and the camber of the wings. Unlike leading edge flaps and trailing edge flaps, leading edge cuffs are fixed aerodynamic devices. In most cases, leading edge cuffs extend the leading edge down and forward. This causes the airflow to attach better to the upper surface of the wing at higher angles of attack, thus lowering an aircraft’s stall speed. The fixed nature of leading edge cuffs extracts a penalty in maximum cruise airspeed, but recent advances in design and technology have reduced this penalty.